Live Line Demo, Inc. - Electrical Safety Presentations. Kyle Finley - Life Line Demo, Inc. Fallen power lines or bare wires should strike fear into anyone who sees them. But just seeing them on the ground or coming into contact with them with your automobile can be an unwelcome surprise indeed, especially when you don't know what to do to stay alive! 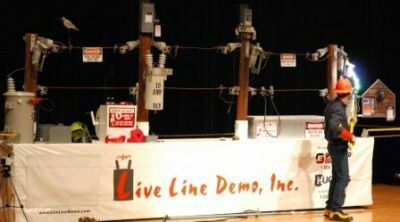 Live Line Demo, Inc. is owned by Kyle Finley of Alvin, Illinois and is in the business of educating people about electrical safety around power lines. He is a member of the Illinois Electric Council and originally presented his ​safety programs through sponsorship of Eastern Illini Electric Coop. Kyle performs safety lessons for employee safety meetings, fire department training, school assemblies, and community events. I've personally seen the program a dozen times or so, having my son being Kyle's assistant may times at both or county fair and at the Illinois State Fair. One thing is for sure, old and young alike, you're never to old to learn or be refreshed on electrical safety! Kyle's demonstrations tell real world experiences because he used to work as a lineman for Eastern Illinois Electric Coop. When a transformer that he would have been working on, had the weather not gotten so bad, blew up, Kyle decided to give up the lineman job and start preaching, well electrical safety that is. Through the employee safety meetings, employers can safeguard their employees with information about lockout/tag-out procedures and over head power line approach distances. Fire department personnel will be educated on safely disconnecting utility connections, including policies and procedures. These lessons will allow them to perform their jobs and respond both quickly and safely to emergency situations. School assemblies are one of Kyle's favorite forums. It is true that what you learn at a young age often carries on to adulthood. Kyle teaches children ages fourth grade and up how to respect electricity and the dangers around it. His Mylar balloon presentation shows children the dangers of letting these type balloons into the air that you may not have thought about. The community events, like county fairs, festivals, and carnivals, are great ways to educate the general population about electrical safety in a fun and usable way. Kyle also speaks to the farm community about electrical safety with farm equipment around power lines. It's very easy to get in a hurry when the crops must come out or even when it's time to put them in the ground. Kyle too is a farmer that understands the stress and strain of getting the job done, but pleads to farmers to slow down and remember, safety first! One of my personal favorites that Kyle points out is how to safely get out of an automobile if you happen to drive over a downed power line. The first response everyone has is to quickly exit the car before it explodes or catches fire, after seeing sparks flying around. Kyle quickly points out that how you leave the auto may determine whether you live or die! Besides, automobiles have rubber tires that often insulate you from the path to ground and sometimes staying in the auto is your safest bet until utility company personnel can disconnect the live power and threat of electrocution from you and your vehicle. To learn more about Kyle's electrical safety demonstration, simply visit his Live Line Demo website.